Join us for a screening of Pacific alumnus Chris Schueler's documentary about scholar and advocate Muhammad Osimi. After the film, Schueler will lead a discussion about Osimi's life and how the film was made. With our world in turmoil through ethnic, religious, cultural and philosophical differences, the message of Muhammad Osimi is crucially relevant. 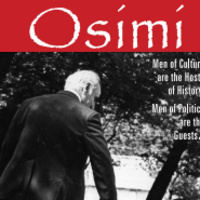 “Osimi” chronicles the historic career and life of a man called the “Nelson Mandela” of Central Asia. Narrated by Academy Award Nominee, Ali MacGraw, his story is about using culture (language, music, poetry and literature) as a tool to connect people and ultimately lead to peace. His work to bolster science and education as the meeting point for all countries will help heal and change our world. The concepts that he lived for, fought for, and ultimately died for, endure and grow through his family, friends and students. An international audience will learn lessons crucial for today as they witness how one man changed the course of a country and won hearts and generations through his words and actions of care and love for his fellow man. Through interviews with former colleagues, friends and family we hear the story of this remarkable man and his public service to Tajikistan, Central Asia and the world. Images from throughout his life, gathered by family members and colleagues over decades, are coupled with video and interviews filmed in India, France, Russia, Spain the United States and his beloved Tajikistan. Three years in the making, the film follows him from boyhood, through World War II, the Tajik civil war, his work with UNESCO and the world's scientific leaders and ultimately to his death at the hands of assassins on his 50th wedding anniversary. Pacific alumnus Chris Schueler has created over 100 television programs in the past 25 years that have garnered 26 Rocky Mountain Emmy® Awards and have been broadcast throughout the country and around the world. Focusing on educational and social issues, Mr. Schueler creates documentaries that are “Television to Touch the Heart.” His documentaries have raised public awareness and also impacted public policy nationally and internationally. His clients include the United Nations, the National Institute of Mental Health, the PBS network, the CBS Network Foundation as well as networks and governments worldwide. He has partnered with television stations and universities to teach documentary film production across the U.S. and throughout the world. Mr. Schueler has led filming crews around the globe including Russia, Asia, Central America, Australia, the Middle East and Africa.